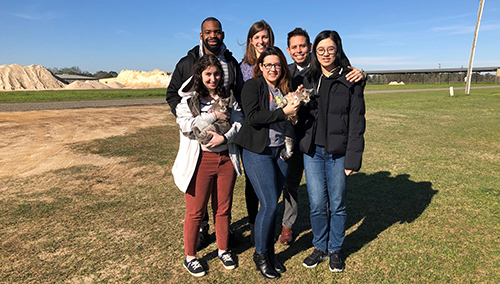 A team of five Vanderbilt Law students led by George Barrett Social Justice Fellow Lynn Stopher ’18 met with immigrant detainees at an Immigration and Customs Enforcement detention center in Ocilla, Georgia, as participants in the law school’s Pro Bono Spring Break program March 3 to 9. Stopher is working as an asylum attorney at the National Immigrant Justice Center in Chicago this year with the support of a George Barrett Social Justice Fellowship. She traveled to Georgia to work with the Pro Bono Spring Break team, which was supervised by Ocilla-based Senior Lead Attorney Elizabeth Matherne of the Southeast Immigrant Freedom Initiative of the Southern Poverty Law Center. SIFI works with the South Georgia Immigrant Support Network, a local organziation that provides housing in Ocilla for teams of volunteers who visit the detention center to screen prospective clients for SIFI’s free legal services as well as for family members visiting their loved ones. “The work can involve anything from interviewing detainees to preparing bond motions and petitions for parole,” Assistant Dean for Public Interest Spring Miller said. In 2018, Miller accompanied student volunteers who spent spring break working at another ICE detention center in Lumpkin, Georgia. The pro bono spring break experience allowed Alvaro Manrique Barrenechea, LLM’19, a Peruvian attorney who plans to practice public interest law after qualifying to practice law in the U.S., to use skills honed over three years of paralegal work at Tennessee Justice for Our Neighbors, a Nashville-based legal nonprofit that serves immigrants. “Most of the clients I interviewed were Spanish speakers, and they were really happy to be speaking to someone in their language,” Manrique Barrenechea said. Manrique Barrenechea was struck by the sheer number of detainees needing legal assistance. “There are hundreds of immigrants in the detention center, and one attorney there to represent them,” he said. The detention center has only one private visitation room for attorneys. “Students were allowed in three at a time, but we had to do some of our interviews on a phone through a glass window,” he said. The team of VLS students also included Elvira Rodriguez ’19, Yuming Zhang ’20 and Elona Belokon ’21. The SIFI Pro Bono Spring Break Trip to Ocilla was one of two Pro Bono Spring Break trips sponsored by Vanderbilt’s George Barrett Social Justice Program, Law Students for Social Justice and the Public Interest Office, which coordinates with annual Pro Bono Spring Break program.